Compact First. Student's Book. Workbook. Teacher's Book. Second edition - Cambridge University Press, 2015. 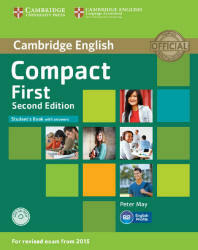 Compact First 2nd edition provides B2-level students with thorough preparation and practice of the grammar, vocabulary, language skills, topics and exam skills needed for success in Cambridge English: First. Ten units cover all four papers of the revised 2015 exam, focusing on one part of each paper in each unit. Reading and Listening texts cover all core Cambridge English: First topics. Writing tasks include both sample and model answers, Speaking activities are designed to improve fluency and accuracy, and to help students express themselves with confidence. Grammar for Use of English pages provide additional focus on grammar, each unit includes a revision page. Vocabulary input is at B2 level and is based on English Vocabulary Profile. Grammar and vocabulary work is integrated in exam practice, including exercises informed by the Cambridge Learner Corpus. This Student's Book with answers provides B2-level students with thorough preparation and practice needed for exam success. Ten units cover all four exam papers in a step-by-step approach. 'Quick steps' and Writing, Speaking and Listening guides explain what to expect in the exam, and provide strategies on approaching each paper, model answers, useful expressions and further practice. The CD-ROM provides interactive grammar, vocabulary and writing practice. Two complete practice tests are available online for teachers to access. Recordings for the Listening exercises are found on the Class Audio CDs or in the Student's Book Pack, available separately. 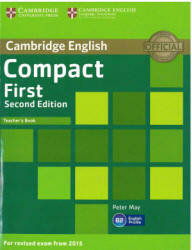 Compact First Second Edition Student's Book has ten units for classroom use. Each unit covers all four papers, focusing on one part of each paper in each unit. The Reading and Listening texts cover all core Cambridge English: First topics. Writing tasks include both sample and model answers and follow a step-by-step approach. The Speaking activities are designed to improve fluency and accuracy, and to help students express themselves with confidence. integrated in exam practice, including exercises based on research from the Cambridge Learner Corpus. Quick steps with advice on how to approach each part of all the exam papers. • Exam tips with useful advice on exam strategies. • Cross-references to the Writing, Listening and Speaking guides, and Grammar reference. These guides explain in detail what students can expect in Papers 2, 3 and 4, and give suggestions on how best to prepare and practise in each case. The guides include a summary of the strategies, advice and tips focused on in the units of the Student's Book with additional tasks and model answers in the Writing guide, and lists of useful expressions in the Speaking guide. 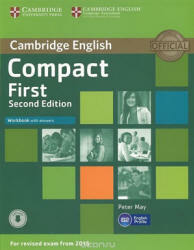 The Grammar reference gives clear explanations of all the main areas of grammar students need to know for Cambridge English: First. The wordlist includes approximately 30 key words with definitions for each unit.